RSE recently signed up to a supplier incentive scheme and the first prize we were given was an Apple Watch. All employee numbers were put into a draw and the winner picked – employee Jack Wilcox. Thanks to Rexel UK Ltd for supplying the prize. 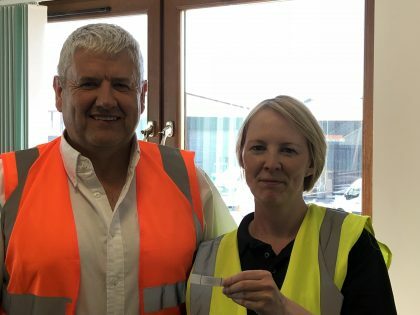 Allan Dallas MD, pictured with Gillian McGillvary, RSE Procurement who is the supplier contact and sourced the Apple Watch, which was then put to a staff raffle with all employee numbers entered in the draw. Gillian is pictured pulling the winning ticket, employee Jack Wilcox.